The project with the most impressive progress is aerc2. It can now read emails, including filtering them through arbitrary commands for highlighting diffs or coloring quotes, or even rendering HTML email with a TUI browser like w3m. Keybindings are also working, which are configured simiarly to vim - each keybinding simulates a series of keystrokes, which all eventually boil down to an ex-style command. I’ve bought a domain for aerc, and I’ll be populating it with some marketing content and a nice tour of the features soon. I hope to have time to work on sending emails this month as well. In the immediate future, I need to fix some crashiness that occurs in some situations. In other email-related news, git-send-email.io is now live, an interactive tutorial on using email with git. This workflow is the one sourcehut focuses on, and is also used by a large number of important free software projects, like Linux, gcc, clang, glibc, musl, ffmpeg, vim, emacs, coreutils… and many, many more. Check it out! I also spent a fair bit of time working on lists.sr.ht this month. Alpine Linux has provisioned some infrastructure for a likely migration from their current mailing list solution (mlmmj+hypermail) to one based on lists.sr.ht, which I deployed a lists.sr.ht instance to for them, and trained them on some administrative aspects of lists.sr.ht. User-facing improvments that came from this work include tools for importing and exporting mail spools from lists, better access controls, moderation tools, and per-list mime whitelisting and blacklisting. Admin-facing tools include support for a wider variety of MTA configurations and redirects to continue supporting old incoming mail addresses when migrating from another mailing list system. Stepping outside the realm of email, let’s talk about Wayland. Since Sway 1.0, development has continued at a modest pace, fixing a variety of small bugs and further improving i3 compatibility. We’re getting ready to split swaybg into a standalone project which can be used on other Wayland compositors soon, too. I also have been working more on Godot, and have switched gears towards adding a Wayland backend to Godot upstream - so you can play Godot-based video games on Wayland. 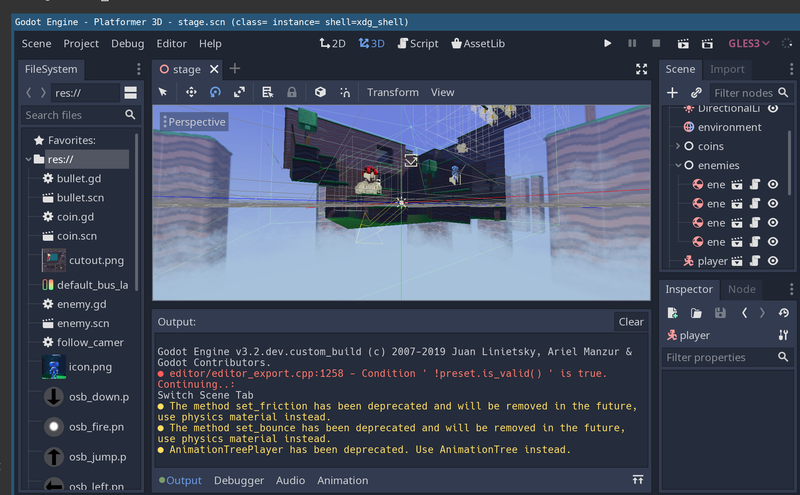 I’m still working with upstream and some other interested contributors on the best way to integrate these changes upstream, but I more or less completed a working port with support for nearly all of Godot’s platform abstractions. In smaller project news, I spent an afternoon putting together a home-grown video livestreaming platform a few weeks ago. The result: live.drewdevault.com. Once upon a time I was livestreaming programming sessions on Twitch.tv, and in the future I’d like to do this more often on my new platform. This one is open source and built on the shoulders of free software tools. I announce new streams on Mastodon, join us for the next one! I’m also starting on another project called cozy, which is yak-shaving for several other projects I have in mind. It’s kind of ambitious… it’s a full end-to-end C compiler toolchain. One of my goals (which, when completed, can unblock other tasks before cozy as a whole is done) is to make the parser work as a standalone library for reading, writing, and maniuplating the C AST. I’ve completed the lexer and basic yacc grammar, and I’m working on extracting an AST from the parser. I only started this weekend, so it’s pretty early on. I’ll leave you with a fun weekend project I did shortly after the last update: otaqlock. The server this runs on isn’t awash with bandwidth and the site doesn’t work great on mobile - so your milage may vary - but it is a cool artsy restoration project nonetheless. Until next time, and thank you for your support! This work was possible thanks to users who support me financially. Please consider donating to my work or buying a sourcehut.org subscription. Thank you!